If my email is any indication, the great divide in our nation is not between the haves and the have-nots, but between the literate and the folks who never learned the difference between there, their and they’re. Trust me, they’re out there, spouting off their strongly held opinions and punctuating their diatribes with veiled threats about how they’re going to “storm the castle,” so if I’m there, I should beware. But plenty of people do open those forwards and read them all the way to the bottom, where my website’s URL follows the text of my column. The column, in case you missed it, was a traditional mom’s take on a few (importantly, not all) life lessons that seem not to have been taught to some (again, not all) of the Occupy Wall Street folks. These lessons include truisms such as “Life isn’t fair,” “Nothing is free” and “Your word is your bond.” I also included a couple of snarky items about the manner in which some (obviously, not all) of the protesters present and comport themselves, because, hey, I’m a columnist, and that’s part of the fun. It should be noted that the now-viral column was the third in a series that I wrote about the Occupy Wall Street “movement,” the first having deconstructed the protesters’ “demands” (Summary: “Everything for Everyone!”) and the second being the serious observation that the protesters’ cries for collectivism will not solve what essentially is a lack of personal and public morality in government and the private sector. Nothing but resurgence in personal and public morality will solve that. Ah, but only the quirky “advice” column is roaming the Internet. That’s a pity, as the serious one was much more important. But back to the issue at hand, that being that I am an idiot, at least according to about 20 percent of the people who have emailed me in response to my tongue-in-cheek parental advice. Except I’m not. An idiot, that is. I’m also not a millionaire with a lobbyist. I do have a lot of dirty work, but in the interest of good taste, I’ll leave my toilets out of this discussion. 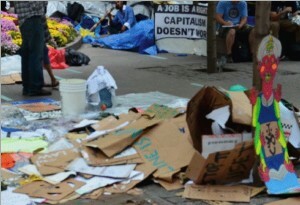 Fortunately, the vast majority of folks who have taken the time to send emails have shared with me their dismay, not only about the substance of the occupiers’ demands and calls for collectivist (read: socialist) solutions, but equally at the essential character of the folks stubbornly overtaking parks and public spaces across the nation. The reality is, much of what is happening in the occupier encampments isn’t pretty, but it also conveniently is being ignored by the dominant liberal media. Occupiers and tea partyers alike agree that greed and corruption may have become the defining features of our public institutions. On this the nation seems to be undivided. Yes, there are protesters who played by the rules but were burned by the system. But for every occupier who has lost a house or a job or carries a student loan balance, there are tens of thousands more who can’t spare the time to shake their fists at Wall Street. They’re too busy starting over, making ends meet, fulfilling their obligations and serving their communities. Marybeth Hicks is a columnist for The Washington Times and founder and editor of Ontheculture.com. Could the London Riots Happen Here? If you enjoyed this article, subscribe to receive more great content just like it. © Copyright Catholic Lane 2019. All rights reserved. every aspect of the Catholic faith - from catechesis to business tips to inspirational stories - all loyal to Catholic teaching.